I met with some success this weekend. 1st: After attacking the warped centerboard with the heat gun and scraper, the board seemed to relax and straightened a bit. Some judicious clamping over a board and pouring boiling water on the concave side helped further. Finally, I set an old boat battery on the board while suspended at either end overnight. This action and drying brought it all back into alignment. With some sanding and glassing on both sides simultaneously, we are back on track. Ugly, but corrected and straight. 2nd: ballast installation detail is worked out and 50% fabricated. I have six pieces of lead. In pairs, they are 15#, 17#, and 19#. 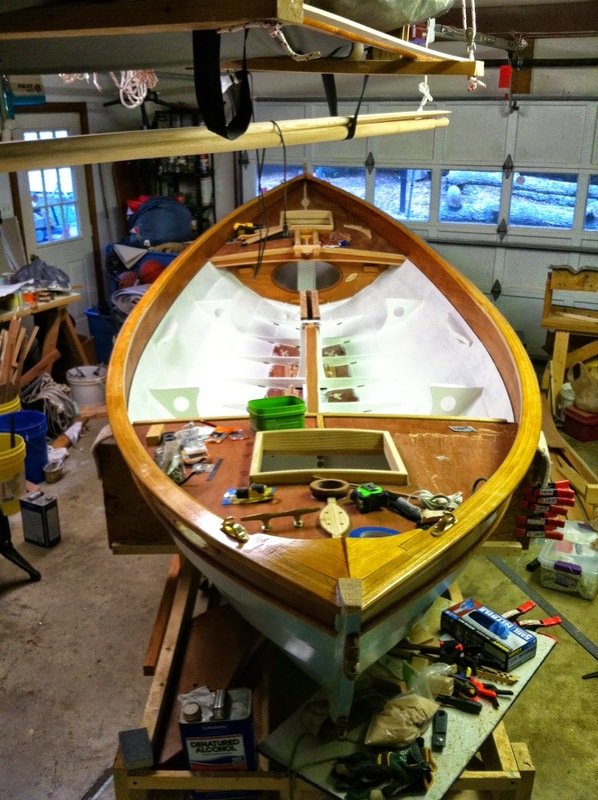 I will have 6 spots around the center case for moving the extra weights fore and aft as required to place boat on its lines. 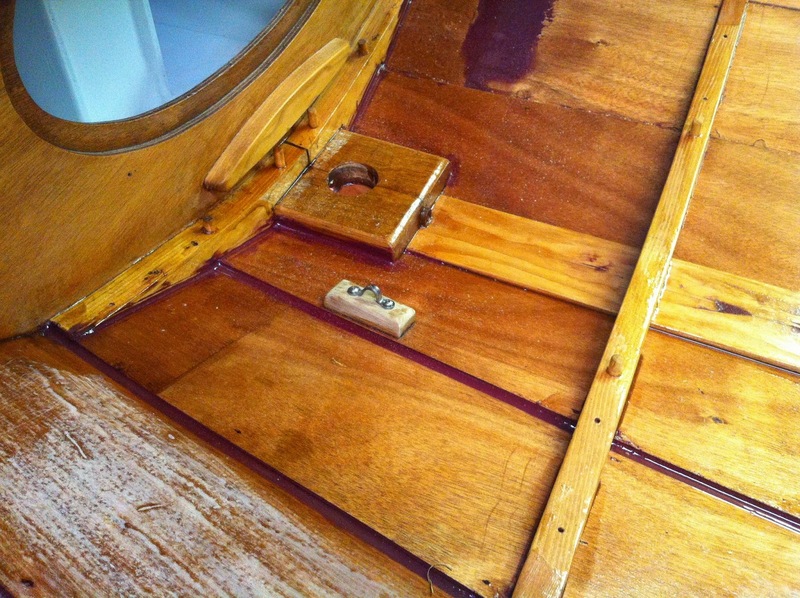 Each piece of ballast was drilled with 2 holes to receive the brass toilet tank bolts which were cut to stay below the floor boards. A paddle bit and drill press made a countersunk recess to keep the nuts and keeper washers low enough. 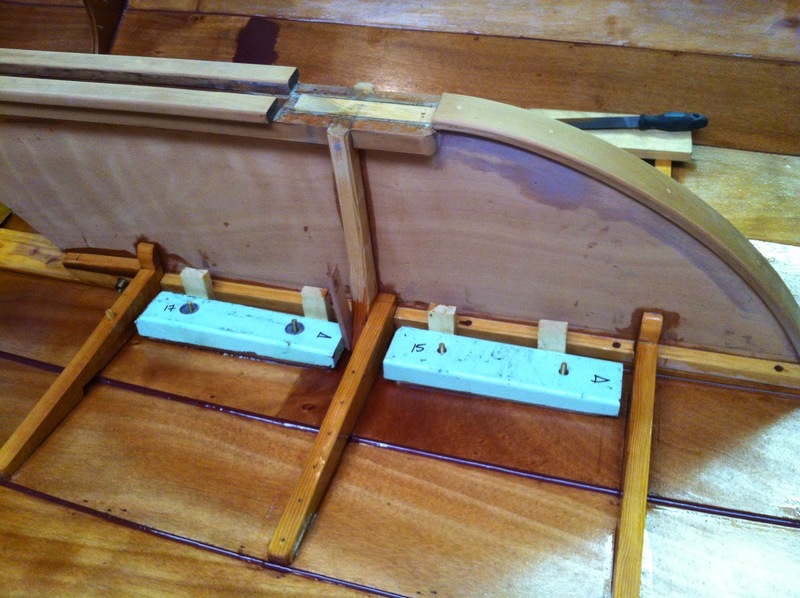 The bolts went through a plywood backer plate glue to the bilge as reinforcement. I will epoxy the bolts to retard any corrosion save for the last 1/2″. I’ll use a piece of rubber rooking to separate the led from the plate once epoxied, primed and painted. 2 of what will be 3 ballast positions per side. Blocks between ballast and logs were required as plates keep slipping downhill on wet epoxy. Ballast plates and dreaded sanding begun. 3rd: The interior finishing began. After an epoxy coat, two coats of primer have been placed while sanding in between. We’ll let this sit for a couple days and then fine sand for the finish coats of paint which will be white tinted slightly with the hull “green” to be easier on the glare. Primed minus ballast areas to be epoxied. 4th: I have the rig and control lines all figured out. I found myself mounting hardware after much study and then coming up with better ideas. So, I’ve a few holes to fill. Once the boat is complete (soon I hope), I’ll take more detailed photos. I expect to be done with painting the interior this week and be moving on to varnishing. The main only position requires a second attachment for the down haul. 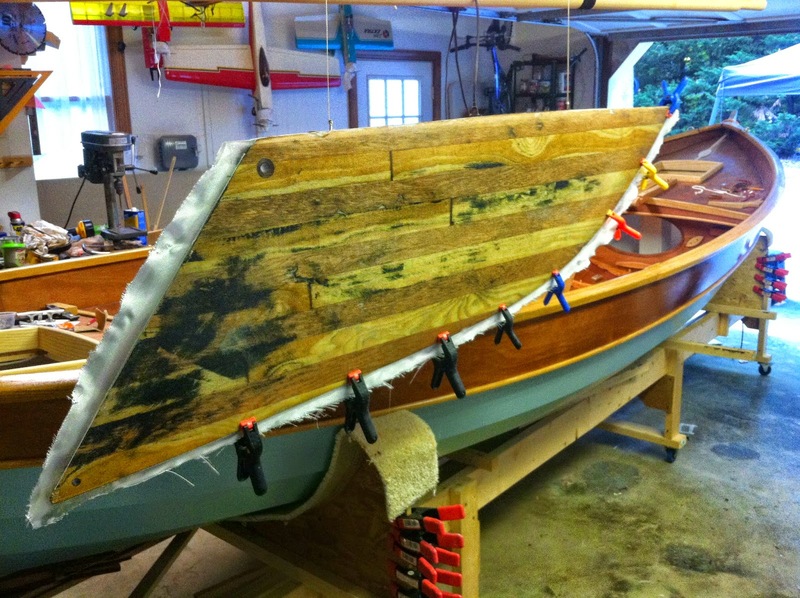 I epoxied an ash block in the bilge forward with an eye for securing a rope loop for the down haul. This will sneak up between floor boards. 2nd down haul attachment point. I still hate sanding. After this weekend, maybe more than before, but progress is evident and getting the rig solved was a boost to buckle down and hit the painting. My rough estimate of time worked thus far is 470 hrs. I should be done in about 40-50 hours more. Hard to believe. None of this includes the time pondering about what to do while away from the boat. Not sure how that computes. Multiply by three!? Who knows. 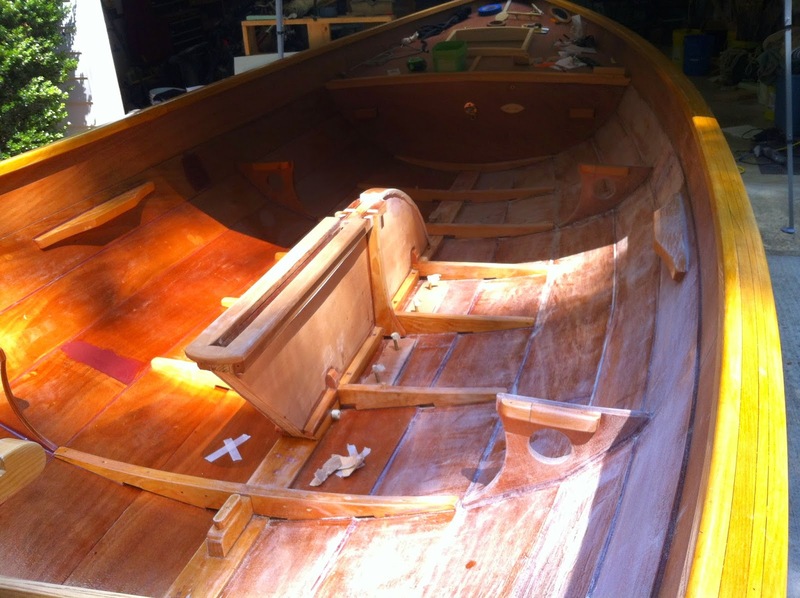 She will be a great boat for sure and aside from the sanding, it has all been fun.